The Camera by Ansel Adams is the first volume in Adam's celebrated series of books on photographic techniques-has taught a generation of photographers how to harness the camera's artistic potential. 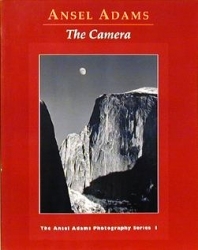 The Camera covers 35mm, medium-format, and large-format view cameras and offers detailed advice on camera components such as lenses, shutters, and light meters. This book remains as vital today as when it was first published!